Arn't thouse supposed to be the sulight coming in through the windows? David yes but where is the arch and usually you have lighter texture (whatever the strength of light source) showing. As for the 'harsh' sun on the floor: i hope TBD can make the sun casting more soft light in some future release. I don't know if replacing the sun by a big omnilight outside would solve this. Yes it would be nice to have softer sun, like giant LEM, but price to be paid would be longer render times... If TBD could do that without horrendous render times than it would be perfect. I always have trouble getting my interiors to look that well lit? Did you put huge Omni's outside of the windows? Are the Window's themselves lights? What was the render time on these? There are no omnilights or Lem's in the scene. The scene is lit just by sky. Rendertime was 3 hours for a 2048X1536 resolution. I am certain a 800X600 takes less than an hour. I used a double wall. The inner part has an arch, while the outerpart is rectangular. Since the sunlight hits the rectangular part first, tha csating on the floor is likewise. 800X600. Rendering just took 29 minutes. I should have increased the 'jaggy' slider a bit. The dark parts look a bit 'sloppy'. It make sense now why the rectangles were showing on the floor. Actually that outside wall that you mentioned is visible on the last image. Yes you are right about AA but dark areas are in my mind ok. It is nice image. biebel could you post that texture u used for the baywindow cushions??? following this thread has been intersting - especially because of Biebels many incredible images This might be my favorite room. The last shot toward the windows that raised all the questions is by far the Best, The light/dark is just NAILED!!! I think the reason for the realism of the last image is the lack of AA. Unless im mistaken the light obviosly is not changed. It plays back to one of Beibel favorite tools - noise, making the image less sparling, sqeaky clean mkes for more realism. Man, the view is quite..fantasy! 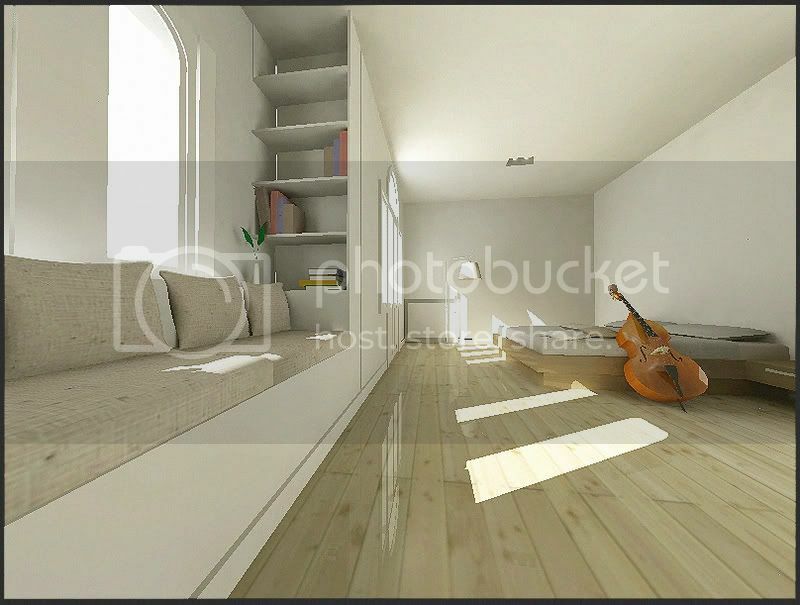 The only thing i don't appreciate too much (plus the direct lighting on the floor: i think it's a little burnt out) is the instrument, perhaps is hard to render.. So, one question, since i'm novice of podium..
You say only sun/skylight were used: in the window holes is there any glass? Thanks for all those nice comments. appreciated. Maybe i will try and render this scene again later on. I share the same opinion about parts of the image being 'burnt'. This was caused by both render setup as post process. I learn as i go, and try to improve where i can. And yes, there is glass in the windows (opacity set to 0).